Visit our fine store to be surrounded by a multitude of soft yarns, hand-crafted tools and books that will help you make your dreams come true. Artisans and crafters find A Weavers Yarn to be an excellent source for inspiration. Susan and Martin Miller, longtime Alaskan residents, carry products from over 50 vendors. Youll find that they stock unusual pieces designed to inspire. 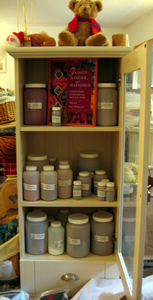 Visit their shop for all your weaving, knitting, felting, needlework and spinning supplies. Weavers may select from Ashford, Leclerc, Louet, Kromski or Harrisville Designs fine looms as well as all of the accoutrements and a wide variety of warp and weft yarns. Knitters will find select fashion yarns, hand-painted luxury as well as traditional yarns to meet your needs. Spinners will enjoy choosing between Ashford, Louet and Kromski spinning wheels. Take University Ave to College Rd. Turn Right. Pass the Farmers Market (on the left). Pass the first cross street (Smith Street), we are the next house on the right.